This is a modern museum with large-format interactive walls, new showcases and a wide collection of objects that reveal the history of FC Barcelona and explain the values that have made Barça ‘more than a club’. 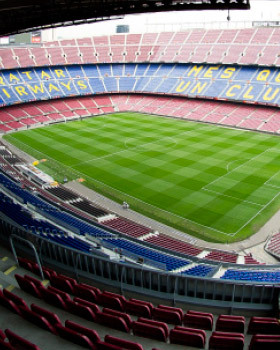 The Camp Nou Experience retraces the steps of players that have made history, such as Kubala, Cruyff, Maradona, Guardiola and Ronaldinho, among others, and visitors can feel the true Barça passion by visiting the most emblematic areas of the Camp Nou: including the visitors’ changing room and the tunnel onto the pitch. Please ensure you collect your entrance tickets from Julià Travel Offices at Balmes str. No5, Barcelona, before going to the Camp Nou stadium.